When a person works out, they loses so much water in their body through sweating. Most people opt to drink lots of water to replenish the liquids lost from their bodies. However, others prefer to drink liquids with electrolytes, as these are deemed more effective in replenishing body fluids. One of the most famous health drinks in the world that contain electrolytes is none other than Pocari Sweat. 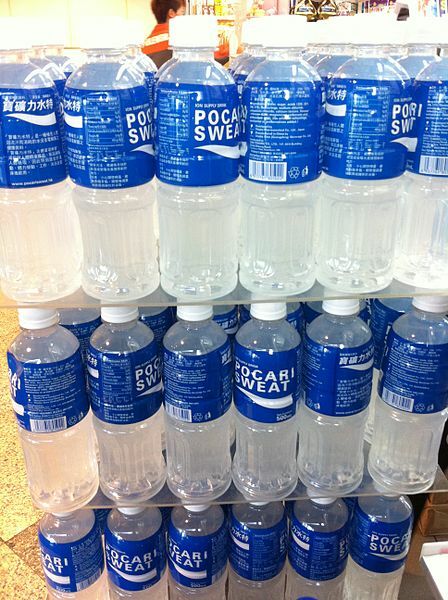 Originating from Japan, Pocari Sweat is a famous health drink that most athletes are definitely aware of. It primarily contains electrolytes that help the body stay hydrated after sweating. These electrolytes mimic the natural fluid balance of the body. It was in the year 1980 that the product was introduced in Japan. Manufactured by Otsuka Pharmaceuticals, Pocari Sweat is consumed not just after a workout but also for various reasons that would require a person to rehydrate fast. The development of Pocari Sweat was done more than 40 years ago. It started when a researcher from Otsuka went on a business trip to Mexico. While in the foreign land, he suffered from diarrhea and dehydration and got hospitalized. The local physician that attended to his needs instructed the researcher to drink carbonated soft drinks as a mean of rehydration. However, this made the researcher wonder if there was a better option or a more suitable drink that could rehydrate the body faster than carbonated soft drinks. The goal was to replenish the electrolytes that were lost in the body. After returning to his homeland, the researcher took notice of the doctors drinking intravenous solutions after their work inside the surgery room. The doctors drank these solutions as a means to refresh themselves. This inspired the researcher to develop a “drinkable IV.” With this concept in mind, the product was developed so as to mimic the natural fluids of the human body. The product called Pocari Sweat was launched in the year 1980. At the time, most people were becoming more and more interested in different ways of living healthily. However, because the product was never heard of or tasted before, they were apprehensive about trying it out. To encourage the people to try the product, Otsuka strived to let the public know of the benefits of Pocari Sweat. 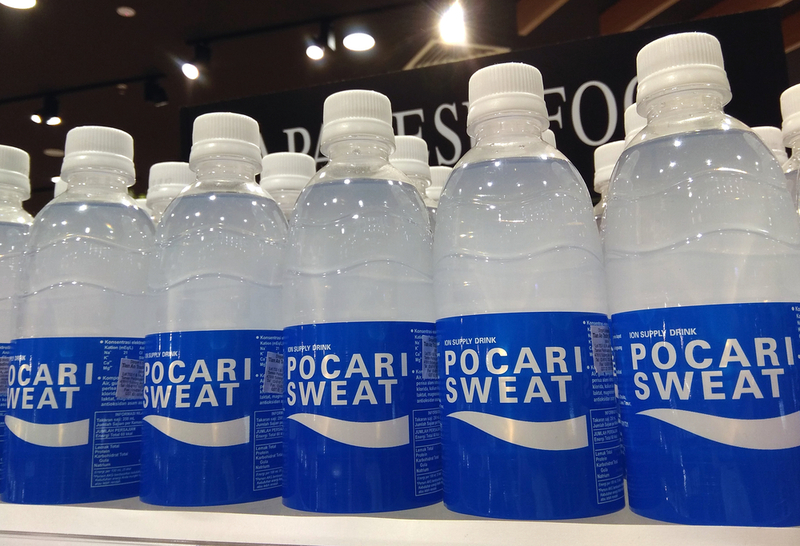 The team behind Pocari Sweat was tasked to research about everyday situations that would lead people to sweat. From there, they would explain the concept behind the drink and its benefits to the people. Chilled sample bottles of Pocari Sweat were given to people coming from places where they would have surely sweated a lot. These places include baseball stadiums and sauna, where people were susceptible to sweat due to exercise and heat. Shoppers were also able to receive sample bottles. A total of 30 million sample bottles were given out in that same year. Slowly but surely, people began to like Pocari Sweat. Just two years after it was first introduced, the popularity of the drink surged. Drinking Pocari Sweat after sweating a lot, may it be from the gym or the sauna, became a common thing in Japan. People also liked the taste of the product. The logo of Pocari Sweat represents the functionality of the product. At the time, usage of “cool” colors for food logos was not considered proper. However, Otsuka still remained steadfast with its decision of using the colors white and blue in their logo due to the meaning of the colors. The color blue stands for the ocean while the color white depicts a wave. Universal concepts are still the main focus of Otsuka to this day. At the same time, the company ensures the quality of Pocari Sweat. It should always be new and fresh. 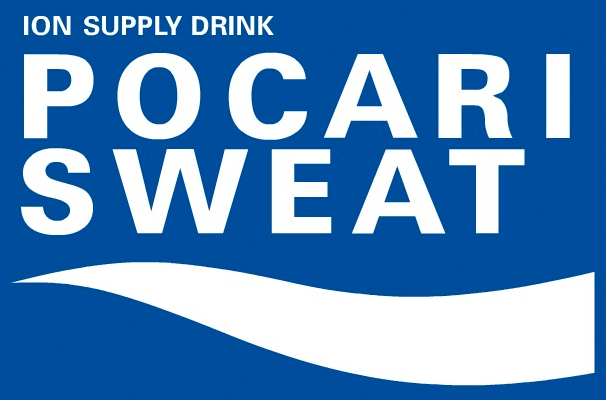 Furthermore, innovation surrounding Pocari Sweat is always ongoing in order to meet the changing needs of society. Moreover, the company still continues to effectively inform the public of the benefits of this drink. Since the introduction of Pocari Sweat, the company did not stop its research on electrolytes and fluid replacement. Due to this research, it was found out that the drink can also be useful in dry environments, where people tend to get parched. An example of this would be during long-haul air travel. Ingredients (Liquid and Powder): Calories, Sugar, Salt, Etc. Consisting of a balance of electrolytes or ions, Pocari Sweat mimics the natural fluids of the human body. Its main purpose is to replenish the water and ions that the body lost in a quick manner. This may have been due to sweating or diarrhea among other things. In Japan, it has become common to drink Pocari Sweat after a hot bath or when playing sports. With a high concentration of electrolytes, the fluid is easily absorbed by the human body. People can also opt to drink Pocari Sweat first thing in the morning to rehydrate and wake up the body. Pocari Sweat comes in many forms. The most common form is a liquid form. Otsuka produces Pocari Sweat in bottles, cans, and even sachets for powders. For every 250 mL plastic bottle of Pocari Sweat, it contains electrolyte concentrations of positive ions in Na+：21, K+：5, Ca2+：1, Mg2+：0.5 (mEq/l) and negative ions in Cl‐：16.5, citrate3-：10, lactate-：1 (mEq/l). The ingredients in a 250 mL plastic bottle of Pocari Sweat are sugar, fruit juice, acidulant, potassium chloride, magnesium chloride, fructose glucose liquid sugar, salt, calcium lactate, amino acids as the flavor enhancer, and antioxidants in the form of vitamin C. Each 100 mL of this consists of 25 kcal of energy, 6.2 grams of carbohydrates, 20 milligrams of potassium, 0.6 milligrams of magnesium, 49 milligrams of sodium, and 2 milligrams of calcium. It contains no protein or fat. This also applies for every 245 mL can of Pocari Sweat. Pocari Sweat also comes in jelly form. For every 180 grams of this jelly, it contains electrolyte concentrations of positive ions in Na+：23, K+：5, Ca2+：1, Mg2+：0.5 (mEq/l) and negative ions in Cl‐：17.5, citrate3-：10, lactate-：1 (mEq/l). The ingredients are sugar, fruit juice, salt, acidulant, potassium chloride, amino acids as the flavor enhancer, antioxidants in the form of vitamin C, fructose glucose liquid sugar, Agar-agar, thickening polysaccharide, calcium lactate, and magnesium chloride. Each pouch of 180 grams consists of 55 kcal of energy, 13.3 grams of carbohydrates, 36 milligrams of potassium, 1 milligrams of magnesium, 93 milligrams of sodium, and 4 milligrams of calcium. It contains no protein or fat. These elements are slightly higher in comparison to those found in the 250 mL bottle as well as the 245 mL can. Another form of Pocari Sweat is in powder form. For every sachet of Pocari Sweat that can make 1 L of fluids, it contains electrolyte concentrations of positive ions in Na+：21, K+：5, Ca2+：1, Mg2+：0.5 (mEq/l) and negative ions in Cl‐：16, citrate3-：10, lactate-：1 (mEq/l). Its ingredients include sugar, powder fruit juice, salt, vitamin C, amino acids as the flavor enhancer, glucose, dextrin, acidulant, potassium chloride, calcium lactate, and magnesium carbonate. Each sachet of 74 grams that can make 1 liter of Pocari Sweat in liquid form consists of 288 kcal of energy, 72 grams of carbohydrates, 227 milligrams of potassium, 6 milligrams of magnesium, 520 milligrams of sodium, and 23 milligrams of calcium. It contains no protein or fat. Some people prefer the powder version as it is easier to carry around. While advertisements usually just show the benefits of Pocari Sweat, there is also some information that may be useful to its consumers. For one, many people mistake Pocari Sweat as an energy drink. This is not true at all. The purpose of an energy drink is to increase the body’s stamina while the role of Pocari Sweat is to replenish the electrolytes lost in the human body. Pregnant women and nursing mother may also be apprehensive about drinking Pocari Sweat. After all, they have to be careful when it comes to the food they eat and the liquids they drink. Fortunately, Pocari Sweat can be consumed by people of both conditions, no matter the stage. In fact, some mothers even prefer to drink Pocari Sweat after giving birth in order to replenish the fluids that they lost. Pocari Sweat also does not have any preservatives. Furthermore, it is also safe to be consumed by children older than 1-year-old. For people suffering from illnesses such as diabetes and hypertension, it would be best to first consult their doctor prior to consumption of Pocari Sweat, as these are special conditions. Pocari Sweat is also recommended for people with dengue fever. People suffering from dengue fever usually have low platelets in their bodies. The type of platelets that can stop bleeding effectively is mature platelets. In order for these platelets to mature properly, the body must have enough fluids. However, people suffering from dengue fever tend to lose more body fluids. Thus, they are more susceptible to dehydration, which in turn affects the maturation process of their platelets. By drinking Pocari Sweat, these patients are able to rehydrate faster, which would help in the maturation process of their platelets to run smoothly. Because Pocari Sweat may taste a bit sour, there is a misconception that it can cause ulcers or stomach pain, which is not true at all. The cause of ulcers is not eating regularly. Eating late or even stressing out can cause the stomach acid to increase, which leads to stomach pain. Despite the taste of Pocari Sweat, it does not cause ulcers. While there are several benefits to drinking Pocari Sweat, one should not mistake it as a replacement for oral rehydration solutions (ORS) during diarrhea. Pocari Sweat is not considered a medicine; rather, it is a supplement. The recommended medicine for diarrhea is still ORS and Pocari Sweat would only help in rehydration of the body. ORS may not always be available should a person suddenly experience diarrhea. If this were the case, people can opt to drink Pocari Sweat as first aid. This would definitely be better than just drinking plain water. Pocari Sweat vs. Aquarius: Which is Better for Fatigue and Hangover? 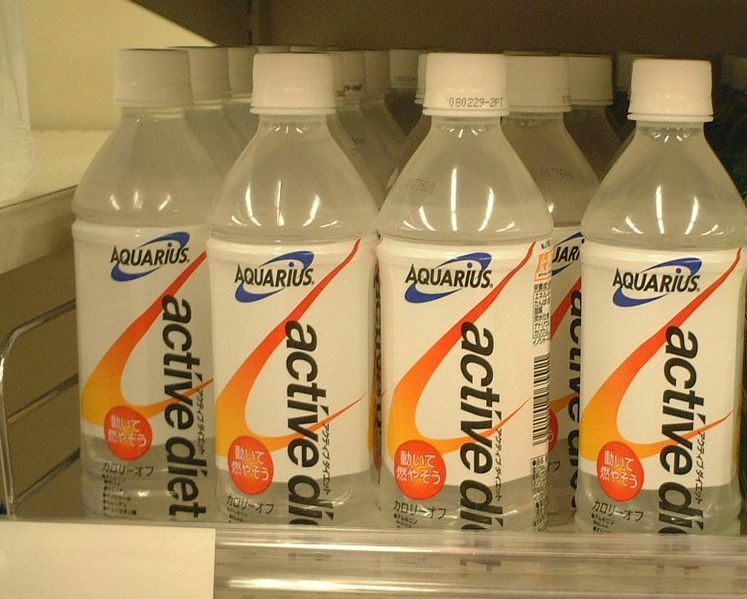 Aside from Pocari Sweat, another health drink popular in Japan is known as Aquarius. Some people choose one, the other based on the flavor or just a matter of preference. However, these drinks are actually suitable to the human body depending on its condition. If a person were experiencing fatigue, the better option between the two would probably be Aquarius. This is because Aquarius contains amino acids as well as citric acid, which are found to be effective in fighting against fatigue. If the goal of the body is to heal, Aquarius may be the better option. On the other hand, many say that the best option is Pocari Sweat if a person is sick. There are two reasons for this conclusion. The first reason is that Pocari Sweat contains more carbohydrates and sodium in comparison to Aquarius. Since most people do not have an appetite when they are sick, they would need these ingredients in order to restore their energy. The second reason is that the ingredients of Pocari Sweat resemble a saline solution’s, which makes it easier to be absorbed by the body. Hence, if one were down with the flu, it would be better to drink Pocari Sweat over Aquarius. The drink is also best drunk after an exercise or during a hangover. Pocari Sweat has become an important drink not just in Japan but in the world as well. Its invention has helped a lot of people when it comes to rehydration. It is most effective to drink during the summer season when people just tend to sweat a lot even without doing anything due to the heat. Pocari Sweat is definitely must-try for everyone.